I’m seeing a slow but growing interest in learning the foodways of the past, and I’m thankful for that because for years I’ve been disturbed by how many people have no concept of how food is prepared or preserved. Some day I’m going to do a post on just that, comments, as I’ve observed them, while doing cooking demos. Today we’re going to take a brief look at a flour substitute that was once common, but which few have any knowledge of today. It can be used alone or combined with other types of flour and its claims to fame are that it is naturally slightly sweet, gluten-free, and has a low oil content. Chestnuts were native to North America as well as Europe. I’ve seen numerous articles saying that Native Americans taught the Europeans to use chestnuts, however, I’m not buying the story. Chestnuts are one of those foods that seem to have evolved in various cultures simultaneously as people explored edible food sources around them. Among the early accounts of chestnuts and chestnut bread in America are De Vries’, “chestnuts, which they dry to eat”, [1600’s]; Rev. Johannes Megapolensis, Jr.  who found, “an abundance of chestnuts, plums, hazelnuts, large walnuts”, etc. ; and Kalm who saw meal made of chestnuts and walnuts [1740’s]. Gerarde  noted, “Some affirme, that of raw chestnuts dried and afterwards turned into meale, there is made a kind of bread”. In later years, F. W. Waugh [1912-15] wrote of the Iroquois that they added crushed chestnuts to corn meal to make bread. James Mooney documented Cherokee bean bread, chestnut bread, cornmeal dumplings, hominy, and corn gruel in a report published in 1891 and a Congressional report noted that chestnut bread was, “a great boon”, in supplementing rations on the Qualla boundary. “…the nuts being used very generally as food, both in the natural state and also in the prepared, “chestnut bread”, being a staple. This is nourishing and quite palatable, even to those not accustomed to its use. This, with corn prepared in various manners, with a little bacon and coffee, makes the ration of the ordinary Cherokee family”. A member of De Soto’s party wrote in his journal of the Indians in Florida using chestnuts and compared them to European chestnuts in 1539. He may have been the first European to pen a record of the use of chestnuts in North America. Other writers of consequence documented the Indians’ use of chestnuts including Capt. John Smith in 1612,“both broath and bread for their chiefe men or at least their greatest feasts”; and Romans in 1775 who spoke of the Creeks having, “dry peaches and persimmons… chestnuts…”. In all of Europe, especially Italy, chestnuts were ground into flour for centuries and the demand often exceeded the supply. “The flour is made into a soup or a dough, which may be mixed with cacas, sugar, rice, or potato flour…It forms one of the principal articles of diet of the poor mountaineers”. – Forest Leaves. Vol. 10. Aug. 1906. In later years, the Italians who could afford wheat flour made bread using one part chestnut flour to two parts wheat flour and the resulting product was said to be most excellent. Immigrants to North America may have done the same, or like Native Americans, they might well have combined it with cornmeal to make bread. Immigrants familiar with them from their homeland knew the chestnut could be prepared as a vegetable or ground into flour and used to make bread and other products. They did so in early times, however, by 1905 one author said chestnuts were a luxury for Americans. While he felt it wasn’t used nearly as much as it should be in America, the writer did note that during October and November the flour could be purchased in the U.S.
Eighteenth and nineteenth century foods made from chestnut flour included polenta, breakfast porridge, puddings, cakes, pies, fritters, pancakes or griddle cakes, stuffing, and the water from boiled chestnuts was felt beneficial for chest complaints. Chestnut polenta was made of the flour with water and salt and it was eaten with cream, butter, ham, &c. The Italians made cakes out of chestnut flour and water which were baked over a fire between layers of chestnut leaves. Those cakes were usually eaten with buttermilk cheese, Bologna sausages, and meat. The native chestnuts grew, “throughout the eastern United States, and is found from southern Maine through Massachusetts, Connecticut, New York, New Jersey, Pennsylvania, Maryland, and southward along the Alleghany Mountains to Alabama, and westward to Michigan and Indiana”. Their commonality tells us they were also known by Southeastern Indians and should be a part of Native American foodways presentations. The chestnut tree blight eventually cast a dark shadow over the collection of native chestnuts, but the fate of the American chestnut is fodder for another post entirely. The Native American chestnut tree attained immense proportions when growing in the open. A tree in Connecticut was documented about the turn of the 20th century at twenty-three feet circumference at a height of four feet above the ground, and eighty feet tall, and there were others even larger. Early in the 20th century, John Parry complained that the U.S. used all it produced and each year turned to Southern Europe for a large quantity of nuts indicating they were once a presence larger than a few roasted nuts at Christmas time. Meanwhile, in America, the Bureau of Chemistry was conducting experiments on various items which might be used here to replace or extend wheat flour including potato, rice, chestnut, dried banana, bran, soy beans, white beans, millet, Kafir, milo, dasheen, cottonseed flour, oatmeal, cassava, buckwheat, rye, corn gluten, Kaoliang, and peas. Any of these items might serve well today. 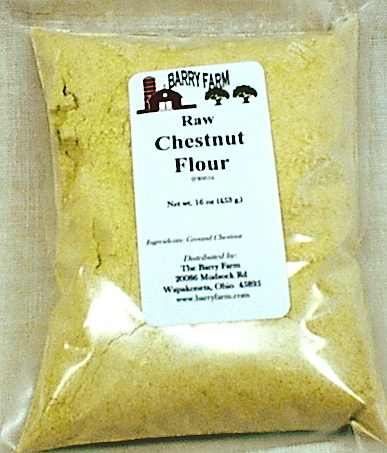 Anyone interested in replacing wheat flour, in whole or in part, might consider chestnut flour but if cost is a factor, making it at home might be preferable to purchasing it as it runs about $10. per pound. For many of us, the cost is increased due to having to add shipping charges. The following recipes use chestnuts in a variety of ways. Either cut a slit in the chestnuts or cut them in half. Place them on a pan and put into the oven to roast until the shells will peel away easily (about 40-45 minutes). Remove the shells and the papery covering (pellicle) and let them cool. Freeze the nuts for about 45 minutes. Grind the frozen chestnuts until you reach a meal-like consistency. Store the flour in an airtight container, preferably in the freezer. To make the flour in a historic setting, or in the absence of a power source, a mortar and pestle should work well. Make a sponge as for white bread, using good white flour. When perfectly light, add a little salt and enough of chestnut flour to knead well. After kneading it thoroughly, form into loaves, put into well-oiled tins, and let it rise until twice its first size, and bake in a moderate oven for one hour. Take 2 cups of chestnut flour, 5 eggs, 1 scant cup of sugar, 2 tablespoonfuls of water, and a pinch of salt. To make the chestnut flour, first dry the nuts before shelling, or toast them slightly with the shells on. By doing this the skins will be loosened and easily rubbed off without blanching; then grind them in a family grist-mill or a coffee-mill to a fine flour, or they may be ground through the nut-butter mill. When all material and cake tin is ready and the oven hot, separate the eggs, and beat the yolks to a thick cream with the sugar. Then beat the whites until they are stiff and crumbly, adding the water and salt after it begins to get foamy but before it is stiff. Then pour in the yolk mixture, and fold it carefully in, and lastly fold in the 2 cups of chestnut flour. Bake like other cakes. Shell and blanch a pint of Italian chestnuts…and cook in boiling milk until tender. Rub the nuts through a colander, add salt and sufficient milk and cream to make a soup of the proper consistency, reheat, and serve. The next two recipes are from “Mazdaznan Encyclopaedia of Dietetics and Home Cook Book: Cooked and Uncooked”. They are unusual by today’s standards but several scenarios come to mind in which the product might prove beneficial. Grind coarse one-half cupful blanched almonds, one tablespoonful walnuts, two tablespoonfuls pine nuts. Add one half cupful flaked oats (or wheat, barley, rice, corn, peas, beans, or lentils). Mix it all thoroughly and moisten with milk, water or fruit juices. Spread in a thin layer. Sprinkle the top with St. John’s bread flour or chestnut flour and expose to the heat of the sunlight for at least one hour. One pound finely-ground chestnuts, two tablespoonfuls ground peanuts, one pound flaked rice moistened with milk to make into loaves. Set out in the sun for an hour. Cut into slices and serve with fruit or vegetables. One pound and a half of boiled chestnuts mashed and sifted. One-fourth of a pound of loaf-sugar, the yolks of eight eggs beat light. Beat the ingredients well together, and spice to suit the taste. Line a shallow pudding-plate with puff paste; pour in the mixture. The Germans call this cake, but it is more like a pie or pudding. Boil 1 ¼ pounds of chestnuts in water one hour. Peel them, scrape off the furry outside; mash the kernels through a sieve, moistening with hot cream. Mix all the other ingredients with puree except the whites of eggs; the yolks having been well beaten before stirring in. CHESTNUT PUDDING [Note: This recipe was included in several 18th century cookbooks including Hannah Glasse, and Richard Briggs. Adjust the nutmeg to taste, and the pudding can probably be made just as successfully with half the number of large eggs]. Put a dozen and a half of chestnuts into a skillet or saucepan of water; boil them a quarter of an hour; then blanch and peel them and beat them in a marble mortar, with a little orange-flower or rose-water and white wine, till they are a fine thin paste; them beat up twelve eggs, with half the whites, and mix them well; grate half a nutmeg, and a little salt; mix them with three pints of cream and half a pound of melted butter; sweeten it to your palate, and mix altogether. Lay a puff paste all over the dish, and pour in the mixture and bake it. When cream cannot be got, take three pints of milk; beat up the yolks of four eggs, and stir into the milk; set it over the fire, stirring it all the time, till it be scalding hot; then mix it instead of the cream. Keep a little butter and sugar to mix with chocolate when the latter is being melted. Boil and skin chestnuts and pass carefully through a hair sieve. Cream butter and sugar, mix well with chestnut puree. Grease ice tray and put mixture in freezing for not more than 2 hours. Turn out on serving dish and pour over it the melted chocolate and serve. This can be cut in slices like a cake. Bertini, Tullio Bruno. “Trapped in Tuscany and Liberated by the Buffalo Soldiers”. 1998. Boston. “Commercial Relations of the United States with Foreign Countries”. Govt. Printing Office, Washington. 1879. Parry, John. “Nuts for Profit”. New Jersey. 1897. Jaffa, Myer. “Nuts and their Uses as Food”. Farmers’ Bulletin 332. U.S. Dept. Agriculture. 1908. Lambert, Almeda. “Guide for Nut Cookery”. 1899. Kellogg, Ella Ervilla. “Science in the Kitchen”. 1892. Norton, Jeanette. “Mrs. Norton’s Cook-book. 1917. Jameson, John Franklin, ed. “Narratives of New Netherland 1609-1664”. 1909 edition. Waugh, F. W. “Iroquois Foods and Food Preparation”. “Illustrated World”. Vol. 30. Sept. 1918. “National Baker”. Vol. 20. April 1915. Hanish, O. Z., Dr. “Mazdaznan Encyclopaedia of Dietetics and Home Cook Book: Cooked and Uncooked. 1905. Chicago. Mooney, James. “The Sacred Formulas of the Cherokees”. Vol. 7. 1891. Washington. Government Printing Office. “Congressional Serial Set”. Report Concerning Indians in North Carolina. Cherokee, N. C., September 6, 1902. Armstrong, Samuel Chapman. “The Southern Workman”. Vol. 49. 1920. Power, J. W. “Nineteenth Annual Report of the Bureau of American Ethnology. 1900. Washington. Government Printing Office. Haskell, E. F., Mrs. “The Housekeeper’s Encyclopedia of Useful Information for the Housekeeper. 1861. NY. Huish, Robert. “The Female’s Friend”. 1837. London. Young, Lady. “Lady Young’s Cookery Book”. 1900. Those trying to become self-sufficient or prepare for trying times are taking a serious look at pressure canning foods just as our grandmothers did. I can’t remember a time in my life when I wasn’t involved in canning food whether it was picking in the garden, breaking beans, shelling peas or washing jars. Mother seemed acutely aware that as a child my hands fit nicely inside the jars to scrub them. Meats are often the most daunting for the novice canner, however, as advised during the early 20th century, “…the meat can be safely canned by any one whether new at the canning game or a veteran in it if directions are carefully followed.”. 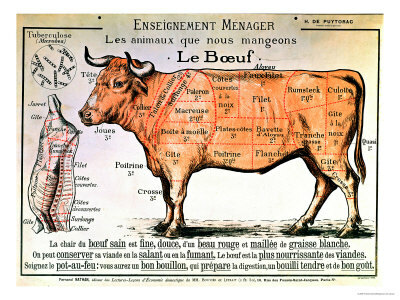 The author went on to say that the fear of getting botulinus bacteria from eating canned meat was just a, “bug-a-boo”, as long as one followed a strict cleanliness regimen, used fresh products, and adhered to the instructions. Making sure there aren’t any chips to prevent a proper seal on the jars is also important. Such jars are still good for storing anything that doesn’t have to be sealed such as salt or sugar. My mother never had the best of luck canning products with meat and I was too young then to be able to evaluate the reasons why. She kept a clean kitchen so that wasn’t the problem and the products were fresh enough. My best guess is she didn’t process the jars long enough, or didn’t leave enough head space when she filled them. She tried to can chicken and dumplings and lost every jar. I’m pretty sure the dumplings plumped too much during processing resulting in the jars being too full to seal properly and absorbed too much of the liquid in the jar for the contents to reach a boil. The jars probably didn’t get hot enough to seal properly if that happened. I’ve canned chicken, ham, and beef as well as various soups (such as bean with ham) and haven’t had a problem. Both a cold pack and hot pack method was found in various books and magazines from the early 1900’s. The advantage to partially cooking the meat or browning it prior to canning is that it may look more appealing. I use the cold pack method most often. The home canner was instructed that any cuts not suitable for canning in solid chunks could be ground, made into sausage, and the fried sausage could then be canned. Grace Gray (1920) included organ meats (sweetbreads, brains, kidneys, liver), liver sausage, head cheese, corned beef, etc. in her canning instructions along with solid meats (chicken, pigeon, pork, rabbit, beef, tongue, fish, oysters, clams, shrimp, crab, crawfish, etc.) Freezers weren’t yet used and farm families often canned pork and chicken to use throughout the year. She didn’t mention canning venison, but that works well. Let’s look at a book from the WWII era, for more information. The author recommended canning meat separately from vegetables because it provided greater versatility than when made into soup before canning it. She advised adding seasonings (onion and garlic included) when the jars were opened for use for a fresher flavor and I tend to agree. Pressure canning sometimes concentrates those flavors to the point the flavor is somewhat off-putting. I do add a half teaspoon of kosher salt per pint of meat before processing it. The home canner was counseled to use quarts or pints for canning meat and avoid using anything larger. I prefer pints because that is enough meat for whatever dish I want to prepare for two people and sometimes I still have left-overs for lunch the next day. Cutting the meat into uniform sized pieces insures it cooks evenly. The 1942 book states cuts with more connective tissue than the rump, round, loin, and chuck could be canned as stew meat or hamburger. Those jars are ideal for casseroles, tacos, hash, etc. It still contained instructions for canning tongue, heart, etc. Meat from poultry was canned and the bony parts like rib meat, backs, necks, etc. were boiled to make broth to fill the jars of meat. North Dakota State University told homemakers to can any extra stock and use it for making soup. Starting with stock instead of water makes a world of difference in flavor. Chicken breast can be canned without adding liquid because enough liquid cooks out of the chicken as it is being processed, but I add water to everything else. When canning ham I fill the jars with water seasoned with a bit of salt and brown sugar. A Bulletin from the Virginia Polytechnic Institute noted that when using the cold pack method, all the juices and flavor stayed in the jar producing a more flavorful product. Gray, Grace Viall. “Every Step in Canning”. 1920. Iowa State College Professor of Home Economics. Stanley, Louise; Stienbarger, Mabel; and Shank, Dorothy. “Home Canning of Fruits, Vegetables and Meats”. Farmer’s Bulletin #1762. 1942. Virginia Polytechnic Institute. “Bulletin No. 66”, June 1921. There have been periods of “boom and bust” in this country since its earliest days, but previously during the hard times citizens knew that better times were coming eventually. A growing percentage of the population no longer feels the U.S. will ever fully recover from this latest downturn, and more and more people think the economy will continue to spiral out of control. Unless manufacturing is brought home from overseas we must content ourselves with being a service-based economy while working for less money, less benefits, less retirement income, less social security, less, always less. In short, congress has lost the trust and respect of previous decades. Having hundreds of government employees sent home without pay because the government has shut down, but yet the President and congress continue to receive regular paychecks is terribly wrong. Teddy Roosevelt, Sir, how do you feel about having national parks closed after you went to such heroic efforts to create them? “All the great natural resources which are vital to the welfare of the whole people should be kept either in the hands or under the control of the whole people.” – Theodore Roosevelt, published in “The Outlook”, April 20, 1912. Programs and basic infrastructure we take for granted are being restricted, suspended, or abolished everyday while we go about our daily lives, many of us seemingly oblivious to the changes around us. On a micro-level, nursing home inspections, restaurant inspections, and sewer/septic inspections for new construction have been severely cut back in my state. Are you, gentle reader, old enough to remember the contagious diseases of the past, such as cholera outbreaks that killed indiscriminately caused by drinking water contaminated by human feces? There is a reason those programs were created. This post is not going to tell you all the things you should consider doing in preparation for trying times – there are enough websites and books out there for that. What it is going to do is look at the history of food preservation through canning to see what we might want to learn in order not to be dependent on fast food or going to the grocery store today for tomorrow’s supper. There are multiple reasons for putting up one’s own food: there are no preservatives; long term storage without being dependent on electricity; it can be less expensive to grow your own or buy in quantity during sales and can it for future use; or having enough food on hand to not only survive but thrive in any situation in which supplies are scarce. Not of less importance is the fact that canned meat and vegetables are a huge convenience when making dinner after a day’s work. Before food was put up in jars, some of it was fermented in crocks and stored for the winter (pickles, sauerkraut, etc.). Nicholas Appert successfully sealed food under heat in glass bottles as early as 1790’s. His method took the prize offered by Napoleon for the most innovative method of preserving food for his troops. Because glass containers were difficult to transport without breaking, metal canisters followed. 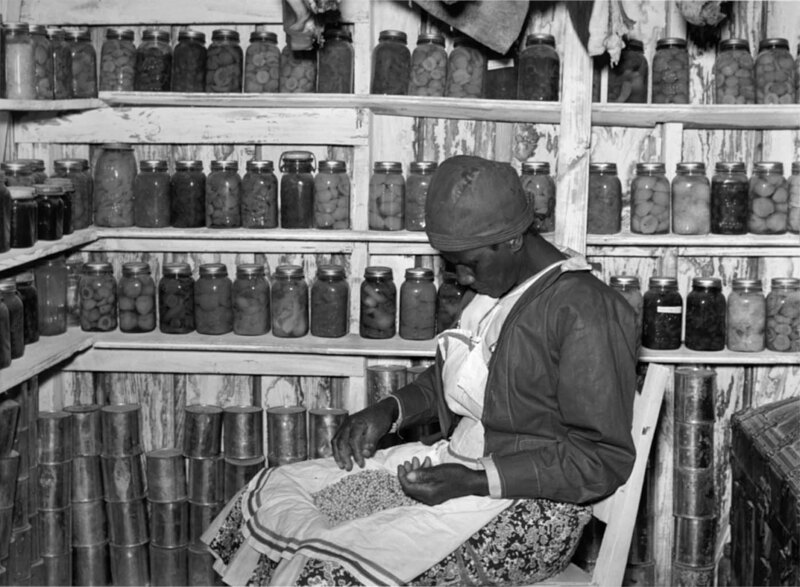 Glass canning jars for home preserving hit market shelves during the mid-19th century, but few people had the money or desire to rush out and buy them, thus canning in jars really became a standard method of food preservation around 1900. The jars were sealed by placing a separate rubber ring on the jar and screwing on a zinc lid. The home canner was advised to use a new rubber ring on each jar although some people did reuse them. Two factors make it possible to keep food preserved in jars – first the contents must get hot enough to kill microorganisms (above the boiling point) and the jar has to remain completely sealed and airtight. Oven canning is a hotly contested practice, manufacturers say it is not safe to put up food without processing it in a steam canner, while individuals claim to have done it for decades without the food spoiling. I haven’t tried this method, however, I may do a few jars just to see how well the jars seal and the food keeps. I think if the lids are heated in hot water before being screwed onto the jars and the contents in the jars is hot enough, it should work just fine. Oven canning is nothing new, Marion Harris Neal gave instructions for canning fruit in the oven at the turn of the century (1900). I suspect the controversy over oven canning is akin to the theory some espouse that canned food can be, “safely kept for up to two years”. Hog wash. Once my mother canned her garden bounty, it wasn’t going anywhere except the dinner table regardless of how long the jars sat in the pantry and I’ve kept jars 10 years and the contents tasted just fine. It might be “best” if used quickly, especially if you profit from selling canning supplies, but as long as the seal isn’t broken on the jar it is not spoiled. Unless stored in a dark place, away from direct light, long term storage in glass jars could result in some slight loss of color but that doesn’t render the food inedible either. Because in our lawsuit-happy world people look for ways to make a buck, notice this disclaimer: No guarantee is made as to the safety of any food, canned or otherwise. Eat at your own discretion.